After several tireless days we have finished crunching the numbers from the more than 700 13F filings issued by the elite hedge funds and other investment firms that we track at Insider Monkey, which disclosed those firms’ equity portfolios as of September 30. The results of that effort will be put on display in this article, as we share valuable insight into the smart money sentiment towards Marriott International Inc (NASDAQ:MAR). The best stock pickers are bailing on Marriott in a hurry, as it was one of 10 Stocks Hedge Funds Ditched in Q3 Just Before the Market Crushed Them. MAR was in 29 hedge funds’ portfolios at the end of September, down from 42 a quarter earlier, and leaving it well off our list of the 30 most popular stocks among hedge funds. 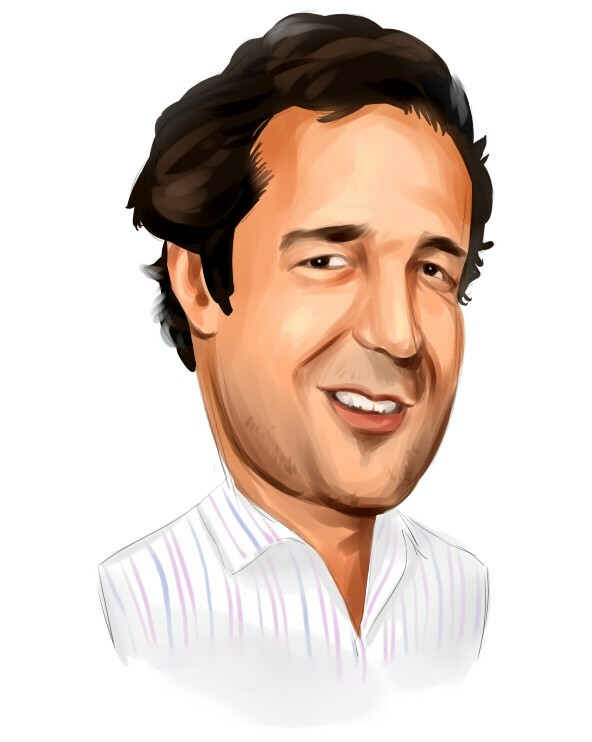 How are hedge funds trading Marriott International Inc (NASDAQ:MAR)? Heading into the fourth quarter of 2018, a total of 29 of the hedge funds tracked by Insider Monkey were bullish on this stock, a change of -31% from one quarter earlier. 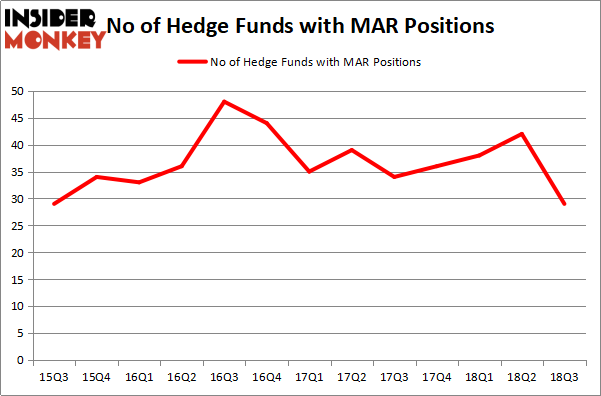 Below, you can check out the change in hedge fund sentiment towards MAR over the last 13 quarters. So, let’s check out which hedge funds were among the top holders of the stock and which hedge funds were making big moves. According to publicly available hedge fund and institutional investor holdings data compiled by Insider Monkey, Boykin Curry’s Eagle Capital Management has the largest position in Marriott International Inc (NASDAQ:MAR), worth close to $824.8 million, comprising 2.8% of its total 13F portfolio. The second largest stake is held by Tom Gayner of Markel Gayner Asset Management, with a $202.2 million position; 3.4% of its 13F portfolio is allocated to the stock. Other members of the smart money that are bullish contain Jonathon Jacobson’s Highfields Capital Management, D. E. Shaw’s D E Shaw and Cliff Asness’ AQR Capital Management. Due to the fact that Marriott International Inc (NASDAQ:MAR) has faced bearish sentiment from the smart money, logic holds that there exists a select few funds who were dropping their full holdings heading into Q3. At the top of the heap, Benjamin A. Smith’s Laurion Capital Management said goodbye to the biggest investment of the 700 funds watched by Insider Monkey, totaling close to $477.4 million in call options. Alexander Mitchell’s fund, Scopus Asset Management, also cut its call options, about $126.6 million worth. These moves are important to note, as aggregate hedge fund interest dropped by 13 funds heading into Q3. Let’s now take a look at hedge fund activity in other stocks similar to Marriott International Inc (NASDAQ:MAR). We will take a look at Capital One Financial Corp. (NYSE:COF), Infosys Limited (NYSE:INFY), Ecolab Inc. (NYSE:ECL), and Tesla Inc. (NASDAQ:TSLA). All of these stocks’ market caps resemble MAR’s market cap. As you can see these stocks had an average of 30 hedge funds with bullish positions and the average amount invested in these stocks was $1.65 billion. That figure was $1.55 billion in MAR’s case. Capital One Financial Corp. (NYSE:COF) is the most popular stock in this table. On the other hand Infosys Limited (NYSE:INFY) is the least popular one with only 18 bullish hedge fund positions. Marriott International Inc (NASDAQ:MAR) is not the least popular stock in this group but hedge fund interest is still below average. This is a slightly negative signal and we’d rather spend our time researching stocks that hedge funds are piling on, like COF.